The story behind this CD is both tragic and uplifting. William Petter appeared set for a noteworthy career as a singer, choral conductor and composer. He began as a chorister at New College, Oxford under Edward Higginbottom. After taking a degree in neuroscience he studied as a tenor at the Royal Academy of Music. He directed a number of choirs in London including, for ten years, the choir at the church of St Magnus the Martyr. Meanwhile his singing career involved appearances with top ensembles such as the The Sixteen, Philharmonia Voices, and the choirs of both Westminster Abbey and Westminster Cathedral. He also established himself as a soloist. In early 2013 he was diagnosed with clear cell sarcoma. Courageously he carried on his musical career but in 2016 his condition deteriorated and he died on 10 October, just a month after his 34th birthday. It was in 2016 that some of his closest friends, including several who, like him, were professional singers, conceived the idea of making a recording of some of his choral music. Petter was heavily involved in planning the project, including choosing the music and I infer from the booklet that the original intention was that he should direct the choir. Sadly, his health was not up to that part of the project and, in fact, the sessions took place less than three weeks after his death. I imagine those sessions must have been quite emotional. The Rose Singers, who have named themselves after Petter’s young daughter are 28 in number (9/6/5/8) and all are members of various leading choirs and ensembles such as the BBC Singers, Stile Antico. The Sixteen, the Monteverdi Choir, and Polyphony. With such a pedigree you won’t be surprised to learn that the standard of singing is exceptionally high. At the heart of the programme lie two Mass settings, both sung in Latin. The Vigil Mass was written for performance at the Easter Vigil service at St Magnus the Martyr on Holy Saturday 2015, though the Agnus Dei was added later that year. The music is a “meditation” on the well-known plainchant Missa de Angelis and thematic motifs from that Mass recur throughout the setting. The Kyrie is a capella (SSAATB) and here I admire the sensitivity of the harmonies. The way Petter provides harmonic enrichment around the plainsong melody is very skilful. The Gloria opens with the plainchant intonation after which the organ bursts out in an exuberant solo. In the liturgies of Holy Week the organ was traditionally silent from Maundy Thursday until this point on Holy Saturday though nowadays some churches take a more relaxed view of that rubric. Here Petter observes that moment of instrumental reawakening. The choral music that follows is dancing and joyful though a more reflective tone is struck in the central passage beginning ‘Domine Deus, Agnus Dei’; here the links to Missa de Angelis are once again pronounced. At the end Petter has a thrice-repeated proclamation of the opening incantation, ‘Gloria in excelsis Deo’ but this time by the full choir. Then, however, he springs a surprise: the four-fold ‘Amen’ begins quietly before expanding into an exultant fortissimo conclusion. The Sanctus begins softly with intertwining high voice lines before building to a very powerful ‘Hosanna’, which sounds quite French to me. In the Benedictus and Agnus Dei Petter enriches the texture quite tellingly through the use of a solo cello (Anna Menzies and Gabriel Amherst respectively). The instrument’s plangent part complements well the gentle tone of the Benedictus. In the Agnus, after a rapt opening, the dark hues of the cello’s lower register contribute to a greater urgency of mood – though not pace – and the organ adds powerful depth to the music. Imaginatively, though, Petter takes the cello up into its higher register later in the movement and this leads the music into calmer waters for the end, where Missa de Angelis is again prominent. The St Magnus Mass was written in 2014 while Petter was in hospital. It’s an a capella setting (SSATBB) and apparently it was originally envisioned for solo voices. All I can say is that William Petter must have had some very expert singers at his disposal in his choir at St Magnus the Martyr. The music is still highly accessible but, though I may be mistaken, to my ears it seems that the harmonic writing is more adventurous, not least in its use of modulation, than anything else on this disc. I have the impression that the music is challenging but rewarding to sing. For example the sopranos have some stratospherically high lines in the Sanctus – here flawlessly negotiated. There’s some very expressive writing in the reflective Benedictus, not least for a solo bass. The harmonic writing in the Gloria is very interesting and skilful and I admired especially the very beautiful central section. The Agnus begins in a pensive mood but expands into an urgent plea for mercy. The concluding ‘Dona nobis pacem’ is gently luminous, high voices to the fore. I’m not sure when the setting of The Lord’s Prayer was composed but it makes a lovely start to the programme. The choir is unaccompanied and the music is serene and, for the most part, gently luminous. I like, though, the way that Petter darkens the harmonies at ‘And lead us not into temptation’. The ‘Amen’ is radiant. The Good Shepherd has Risen was written for the Fourth Sunday of Easter (‘Good Shepherd’ Sunday). It’s a most effective piece which starts in a quite contemplative fashion before gathering in both pace and intensity. A beguiling soprano line at ‘Look upon your flock’ introduces a lyrical section in which the harmonies are richer. The end is marked by dancing music to the word ‘Alleluia’. Like several of the works here recorded Come Down, O Love Divine was composed for the London Contemporary Church Music Festival, in this case the 2016 festival. Its origins are earlier, however. Petter had written a last verse descant to Vaughan Williams’ great hymn tune for his own wedding. In 2016 he expanded this into a full-blown anthem for choir and organ. In the first three stanzas of the hymn Petter weaves an attractive fantasy around Down Ampney. Then, for verse four the tune is heard in full in the soprano line before the verse is repeated with the fine soprano descant. As the original design of the decant was for it to augment and decorate congregational singing that effect is replicated here and, in a very nice touch, members of three choirs with which William Petter had been associated join in as the “congregation”. With Paul Plummer contributing a majestic organ part to the mix this makes a stirring conclusion to the programme. The music on this CD is excellent and it would enrich any liturgy. One can’t help but feel sadness that William Petter’s compositional voice was stilled at such an early age but his music constitutes a fine if slender legacy. His friends could have paid no finer tribute than by recording his music by which means one hopes it will come to the attention of a wider public. It would be good to think that these recordings will stimulate the interest of other choirs. 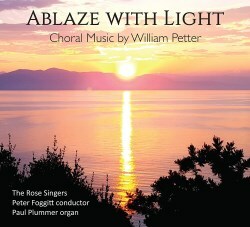 Copies of the music are available through William Petter’s website. It remains only to say that the performances are splendid. The recordings were produced and engineered by Robert Rice and Sam Lea respectively and they’ve done an excellent job. The well-produced booklet includes very good essays by Paul Plummer and by the composer’s brother, Oliver Petter. If you buy this disc not only will you be giving yourself the opportunity to discover some very rewarding music but you’ll also support a very worthwhile cause. All the proceeds from the sales of this disc will benefit the work of the charity Sarcoma UK.